November in New Orleans is jam-packed with festivals and celebrations. It’s also a magical time to be here, with a stretch of perfect weather leading up to the winter holidays and Mardi Gras. 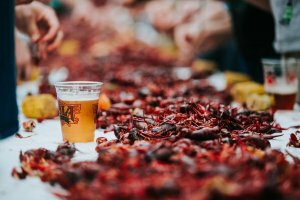 Here are some of our favorite suggestions on what to see, eat, and do if you’re in New Orleans in November. Friday, November 9, 6-10:30 p.m.
Every November celebrity chef Emeril Lagasse invites scores of top local and national chefs to join him for his one-night fundraiser featuring a specially curated, Louisiana-inspired menu, live music and open bar. 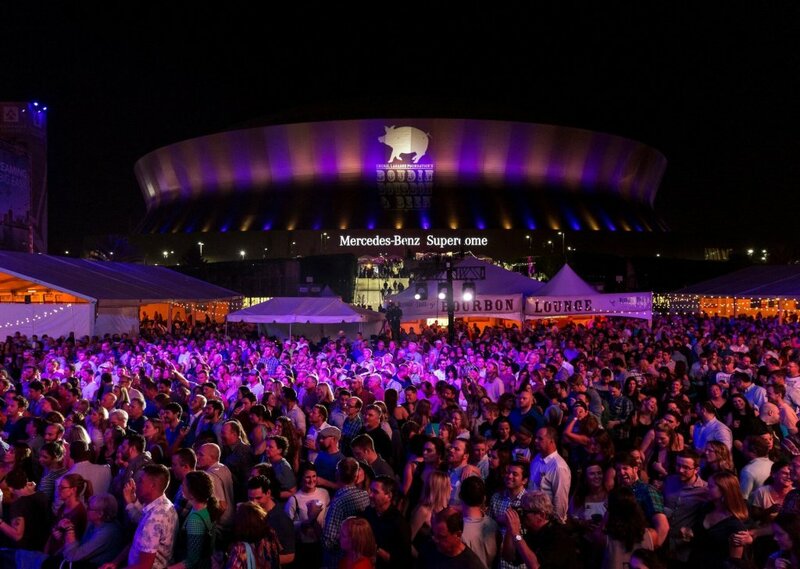 This year more than 70 chefs will participate in the 8th annual Boudin, Bourbon & Beer held at Champions Square (Lasalle St.), an outdoor festival plaza located adjacent to the Mercedes-Benz Superdome. The participating chef list is an impressive who-is-who on both local and national levels. This year, the New Orleans chefs include Commander’s Place Tory McPhail, Nina Compton of Compere Lapin and Bywater American Bistro, Isaac Toups of Toups Meatery and Toups South, Chris Borges of Josephine Estelle, and many more. For a full list of featured chefs and the menu updates, visit the event’s website. Tickets are on sale now ($135) and include unlimited food, open bar, cigars, and access to the auction and featured entertainment. The fundraiser benefits Emeril Lagasse Foundation, which focuses on culinary education, nutrition and arts programs. Sunday, November 11, 10 a.m. to 6 p.m.
There’s a po-boy for every budget and palate in New Orleans — and at the Po-Boy Festival you can sample the best po-boys the city has to offer. The fest will be held between the 8100 and 8800 blocks of Oak Street in the Carrollton neighborhood. About 35 vendors will present more food that you could shake your fork at, with over 50 varieties of the delicious sandwich alone — plus beer, specialty cocktails, and desserts. Admission is free, but you’ll need to purchase a $5 wristband at the fest to purchase the po-boys. 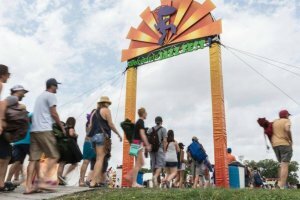 New this year, are two types of the “fast pass” that would let you bypass the line to enter. Just like in the past years, some of the best restaurants in the city will once again compete in several “Best of” categories. This comedy fest has originated in Austin but is becoming a New Orleans mainstay since its Crescent City debut in 2011. Get ready for a diverse lineup featuring improv, sketch, and stand-up, including an all-female showcase on Thursdays. The New Movement space (2706 St Claude Ave.) will host. Proceeds from the Hell Yes Fest will go to organizations dedicated to aiding and empowering sexual assault survivors. Saturday, November 17, 11 a.m. – 5 p.m.
Another new festival popping up? Why not? And who doesn’t like cheese? The inaugural Fête des Fromages will be held at the New Orleans Jazz Museum at the U.S. Mint (400 Esplanade Ave.), presenting more than 100 artisan cheeses from all over the world. Those will be paired with wine, beer and cider, and a few cheese experts and local chefs will be on hand to present on the history of cheese. Add to it some live music, a cheese-wheel cracking competition between two chefs attempting to break down a 65-pound slab of cheese, cheese-related merch, and you got yourself a fine Saturday of sampling, sipping, and maybe some early holiday shopping. Tickets are $30 for adults and $12 for kids ages 4-16. Saturday, November 17, 3-10 p.m. This is another brand new festival, this time honoring one of America’s favorite apps, chicken wings. Conceived and produced by Marc Bonifacic of Central City BBQ and Shane Finkelstein, producer of Top Taco Nola and owner of Nacho Mama’s Mexican Grill, Wing Wars will showcase 20 local restaurants as they smoke, baste, sauce, and fry over 40,000 chicken wings, battling it out for Tiger Sauce’s “King of the Wing.” Wing Wars will be held at the Smoke Yard at Central City BBQ. Big Sam’s Funky Nation is part of the music lineup. Early bird tickets are $10 and $20 at the door. Saturday, November 17 – Sunday, November 18, 11 a.m. – 7:30 p.m. The annual Tremé Creole Gumbo festival serves up the perfect trifecta of gumbo, brass bands and cooler temps, returning to celebrate over a decade of existence at Louis Armstrong Park (701 N. Rampart St.). The free festival will show off New Orleans’ staple stew in all its savory varieties, from gumbo z’herbes and dark roux to the non-traditional vegetarian- and vegan-friendly versions. Of course, there will be traditional gumbo — seafood, chicken and andouille, filé — and cooking demos if you want to learn how to make that perfect roux. New this year, the food court is expanding into Armstrong Plaza to accommodate the ever-increasing number of vendors. The world-famous, Grammy-winning Rebirth Brass Band will headline, joined by the Hot 8, the Pinettes, the Tremé, and the Free Agents brass bands. Free bicycle valet will be available on both days on festival grounds, courtesy of Bike Easy. Each November the Bayou Classic draws the fans and alumni of Southern University and Grambling State University to New Orleans to partake in one of the country’s greatest college sports rivalries. This year marks the 45th annual event, which has become much more than a football game, drawing more than 200,000 visitors to New Orleans. The event stretches for three days and includes a fan fest, a parade, battle of the bands, and, of course, the big game at the Superdome (you can get tickets online or at the gate). The battle of the bands between the Grambling “Marching Tigers” and the Southern “Human Jukebox” on Friday is an unforgettable extravaganza (tickets). The same two marching bands will lead the Annual Bayou Classic Parade on Saturday, starting at 9:30 a.m., from the Superdome to the French Market. The parade will have the elements of the Zulu Social Aid and Pleasure Club, floats, military units, and more. In other words, expect a great show. November 16-January 1, Fri.-Sat. 5-11 p.m., Sun-Thu. 6-10 p.m. This beloved New Orleans tradition is celebrating its 32nd anniversary this year, and had been selling out for the past few years. Celebration in the Oaks is a dazzling holiday lights festival scattered throughout the 25 acres of the City Park, including the Botanical Garden, Storyland, and Carousel Gardens Amusement Park. Stroll through the magical grounds swathed in hundreds of thousands of twinkling lights, take a train ride or a holiday picture by the iconic Mr. Bingle, listen to the caroling, do some holiday shopping, or ride the historic carousel. Admission is $10 per person (kids under 3 are free), unlimited rides band is $18. See a list of events happening this November. Be sure to check out our resource for French Quarter Hotels.